I’m happy to announce that last Friday I updated the book! 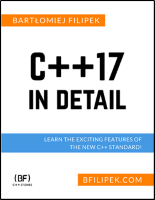 “C++17 In Detail” grew by 31 pages (up to 250), includes two new chapters and lots of “bug” fixes and better explanations. To prepare the new chapters I started doing some experiments with new searchers objects and conversions in August and September. In the book, I’ve even done a benchmark to see what you can expect from the new functions. I created an application that performs a round-trip: converting from a vector of integers, into a vector of strings and then back to another vector of integers. Usually, the new conversion routines performed 2x…5x faster than functions like itoa, sprintf, stoi. And that happens across all compilers I’ve used: Clang 7.0, GCC 8.2 and Visual Studio 2017 15.8. So far GCC and Clang offer only integer support, Visual Studio has additionally floating point support for from_chars (and hopefully to_chars will get floats in 15.9). I hope to finish the book with two major updates: at the end of October and then at the end of November. 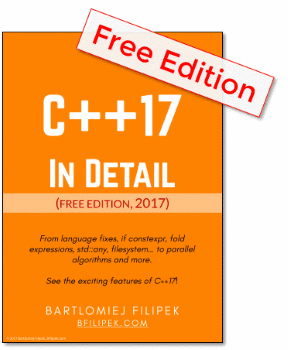 Until the book is not 100% done, you have a chance to buy it much cheaper and get free updates later. Tomorrow (Tuesday 3rd Oct) I’m planning to increase the minimum price, from 9,99$ (suggested price is still 24,99$) so today you have a chance to buy it at a lower price. Let me know what’s your experience with the book. What would you like to change? What would you like to see more?